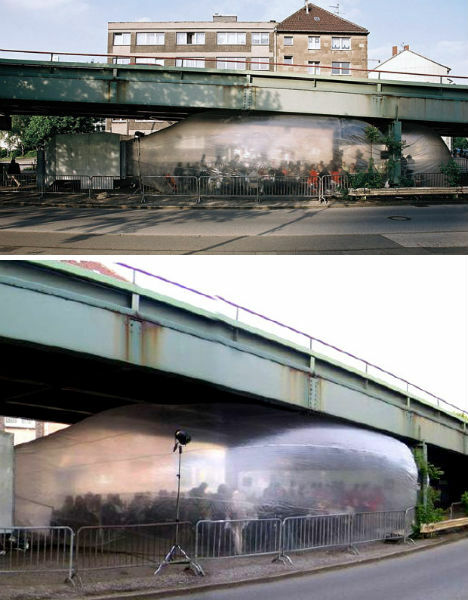 Ephemeral, often amorphous inflatable structures eschew the nature of human habitation, occupying a space only temporarily and making few promises about protection from the elements. Altering existing structures or creating usable, climate-controlled event space in typically undesirable urban locations, these 17 (more) blow-up buildings, balconies, complexes and even entire cities can be assembled and taken down in mere minutes. Berlin-baed architects Raumlabor are renowned for their thought-provoking temporary work including Spacebuster, a massive inflatable space coming out of the back of a van, which occupied public spaces in New York City. 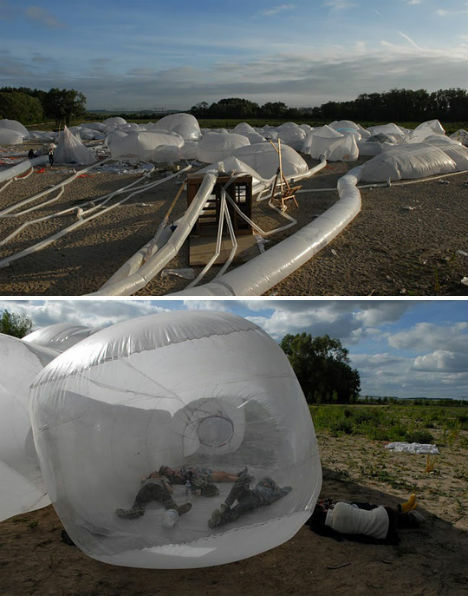 The inflatable structure could hold as many as 80 people at a time and was used for community events. 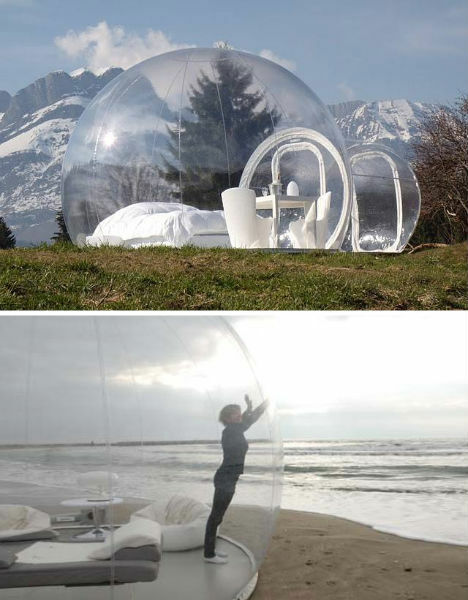 Rent an inflatable, transparent ‘bubble tent’ and place it just about anywhere in the South of France, from the hilly countryside of Mont Blanc to the beach or even in a tree. CristalBubble Hotel is 13 feet in diameter with a king-sized bed; certainly the most comfortable way to sleep under the stars with a 360-degree view. Designed for two adults, the bubbles can be expanded to add a smaller children’s room. 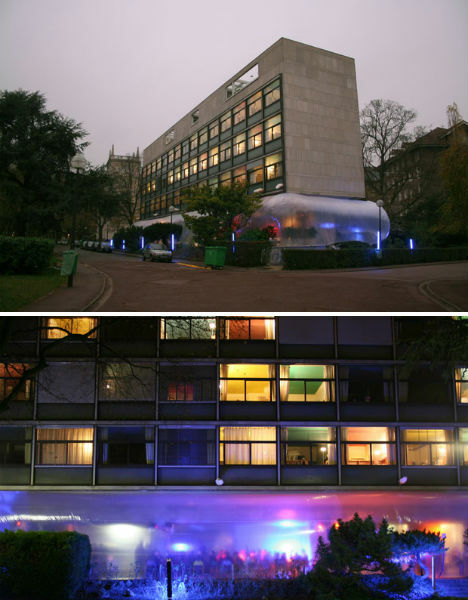 The space beneath an urban office building in Berlin was wrapped with a clear inflatable membrane for the 2008 project ‘Hovercraft – Lifting Modernishm’ by Raumlabor. For three days, the membrane transformed an underused area into ideal event space, protected from the elements and from the cold November air. It was used for concerts, speeches, dinners, a conference and a party. 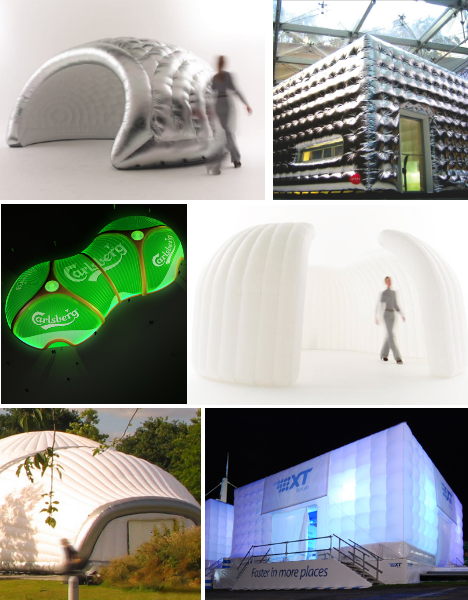 UK-based Inflate produces modern, minimalist blow-up structures tat are perfect for throwing parties and events. 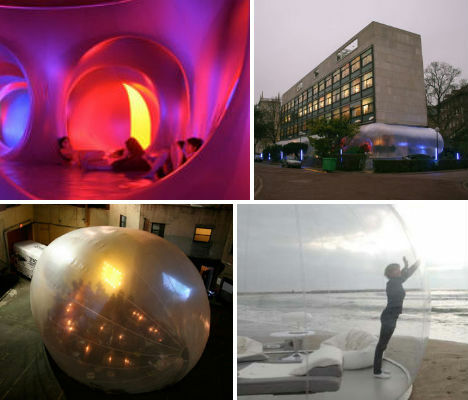 Ranging from small, simple ‘Lite’ structures that hold only a handful of people to interconnected domes that measure 80 feet long, Inflate’s structures cost between $1,300 and an eye-popping $70,000. 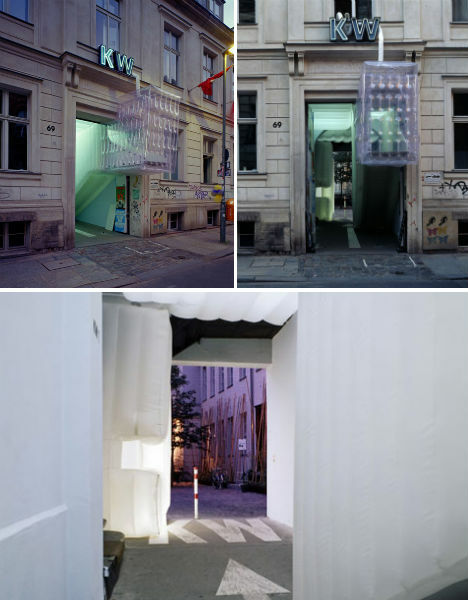 On-Air was a temporary inflatable installation in the doorway of the KW Berlin exhibition space, created by Instant Architecture. The installation involved a pneumatic structure that cantilevered a balcony out over the street, altering the space without harming the historic building with a single nail or screw. As Instant Architecture notes, the structure was strong enough to withhold the weights of visitors, but unfortunately not impervious to the unwanted attentions of nighttime vandals who were determined to pop it. PinkCloud.DK gives the abandoned Miami Marine Stadium an imaginative makeover with INFLATABLE, a proposal that would transform the space into a floating performance venue. 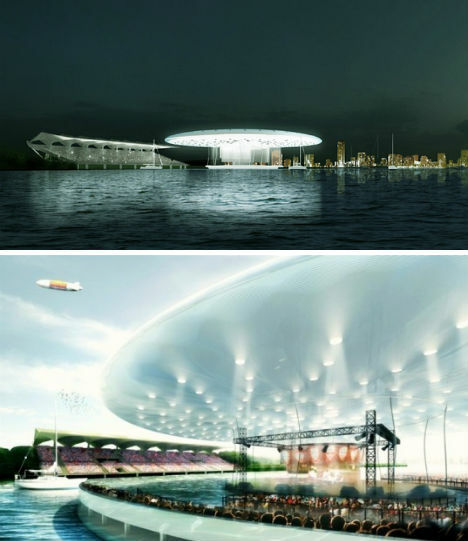 The low-cost, inflatable structure floats on the river and is entirely covered wit solar panels to generate its own electricity for events. 280 feet across, the disk would be filled with helium and anchored with six cables. 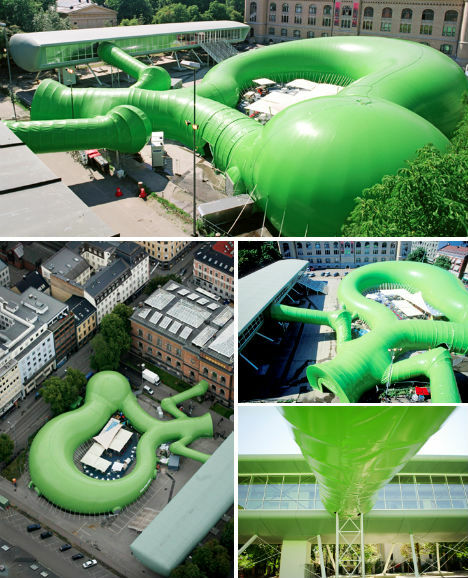 Yet another incredible inflatable project by Raumlabor, The Kitchen Monument takes the ‘Hovercraft’ concept of an inflatable spaces pumped out the back of trucks and brought it to raw urban settings like the spaces beneath overpasses and viaducts. The resulting protected space makes these often-unpleasant forgotten corners of cities feel more welcoming. Architecture firms FRENTES and PAX.ARQ proposed this undulating inflatable structure for the Mobilizarte Mobile Cultural Structure competition. 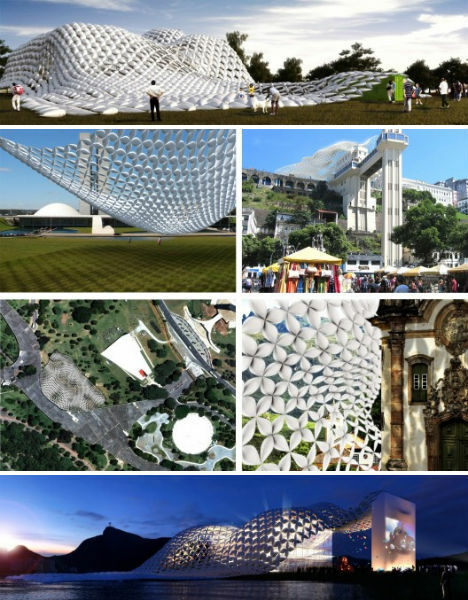 It consists of a set of scaffolding towers, lightweight freestanding structures that provide internal framework, and a crochet-inspired inflatable membrane that will shade the space during the day and become a source of lighting at night. This wacky, brightly colored creation is called ‘Amococo’ and it’s made up of 86 triaxial domes and 71 pods. 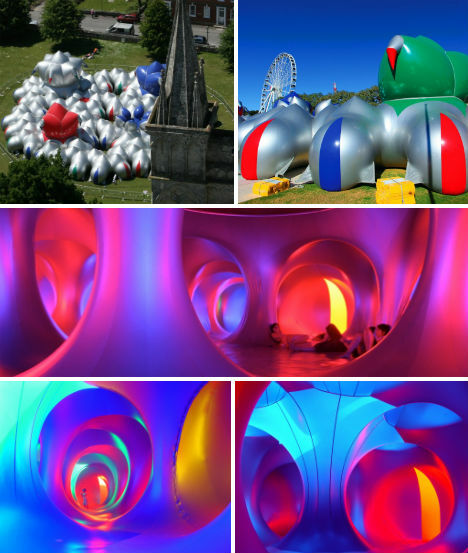 Architects of Air bring the massive inflatable sculpture to festivals and other events, where guests can wander through its labyrinthine halls. The translucence of the vinyl and strategically placed windows carry daylight throughout the structure in vivid colors. 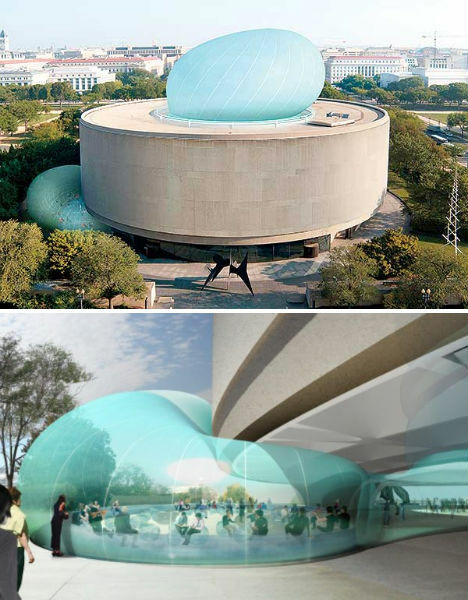 Washington D.C.’s Hirshhorn Musuem and Sculpture Garden, part of the Smithsonian Institute, will soon get a stunning inflatable pavilion that will wrap around one side of the round building and balloon up from its ceiling. 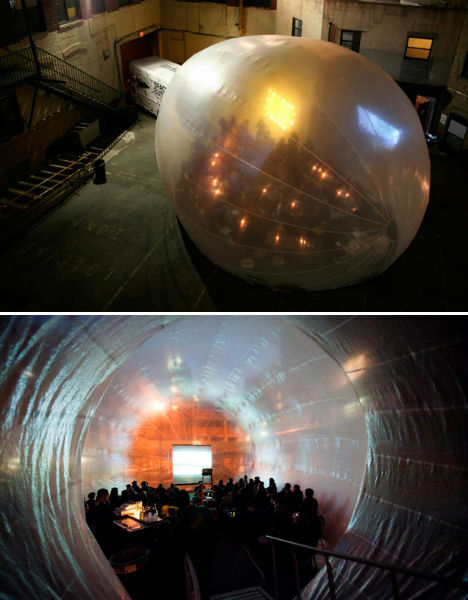 Architects Diller Scofidio + Renfro plan an auditorium, cafe and meeting place for the inside of the inflatable structure. Construction of the installation will begin sometime in 2012.